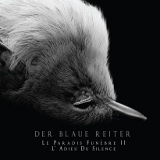 Catalan darkwave project Der Blaue Reiter's sound in Le Paradis Funèbre II: L’Adieu du Silence reminds me, in many ways, of Camerata Mediolanense's, which my colleague Alex reviewed last year. There are similar neoclassical stylings, but the music is darker and more modern, with more nods to modern dark electronica than to the medieval inspirations of the latter. It's strange but interesting, with plenty of crossover appeal for metal fans, including myself. Underworld Dreams II starts with the sound of a classical opera, but drops beneath the surface to a dark, machine-like pumping and atmospheric effects, broken into occasionally by an epic orchestral theme backed by buzzing electronic samples. Anthem for Doomed Youth is mostly quiet but with an ominous background, with the two vocalists, Sathorys Elenorth and Lady Nott reciting a poetic spoken-word narration over it. Somehow, however, that never quite clicks enough to become as atmospheric to the listener as the pair would like it to be, and without more tracks preceding it, it falls kind of flat. Conquest of Glory does better in this regard; Lady Nott's heavily-accented voice, backed by a relentless marching beat and choir vocals in the background, gives the track a hard, urgent point that it uses to good effect, followed by the very pretty -- and wholly instrumental -- keyboard/violin piece that makes up the first part of the title track. The Beginning of the End is probably my favorite on the album. Elenorth and Lady Nott do a much better job than on Anthem for Doomed Youth, with a flat, deathly tone in their recitations, and the slow but deliberate beat combined with the electronic effects is spellbinding. Requiem for a Dying World and The New World Order are both instrumentals, the first being a soft, sorrowful piece similar to the title track, and the second being a nervous palette of synthesizers and violin, with no percussion except for electronic blips until the last part of the track. Conspiracy, on the other hand, is the complete opposite: Very minimal on the instruments, it relies on heavy percussion to drive it along to the sound of the vocals. Le Paradis Funèbre II makes for a very dark and listenable album, though I have the feeling that if I listened to stuff like this for too long, I'd probably fall asleep. It'll probably make for a good break from metal if one wants something a little quieter at some point or another.